Ask Catherine Ross, director of the Teaching and Learning Center, what fires her imagination and she’ll tell you it’s all about teaching — but not just the day-to-day classroom experience. With blogs, wikis and websites, opportunities for interdisciplinary learning and team projects have grown exponentially. “We need to bring all the disciplines to bear in order to find solutions to the complex problems facing the world today,” she says. Ross offers one way to improve teaching that only takes a moment. 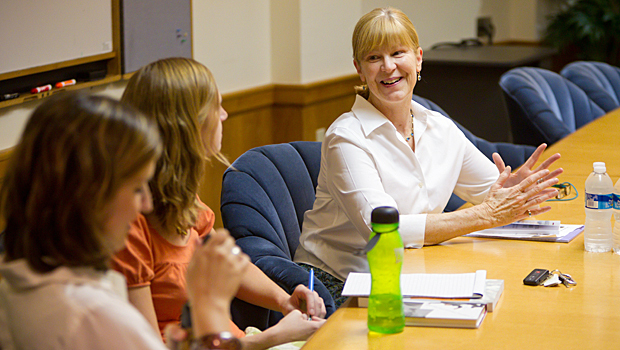 She encourages faculty to try the “one-minute feedback” technique to gauge how learning is progressing in the classroom. “This is the perfect time in the semester to check in with students to see how things are going,” Ross says. “Leave about a minute at the end of class and ask students to write a response to this question: What could we do to improve your learning in this class? The wording is very important as the professor needs students to develop comments by reflecting on their own learning. ” This exercise, Ross explains, encourages students to take responsibility for their own learning and offers instructors a chance to talk with their students about the class and about the pedagogical reasons for doing certain things a certain way. Ross will be working closely with Associate Professor of History Susan Rupp to develop workshops and programs to assist faculty in the College, as well as the graduate schools and the Schools of Business, Divinity, Law and Medicine. Ross was the associate director of the Institute for Teaching and Learning at the University of Connecticut before joining Wake Forest this summer.